With January being the quietest month of the travel season in western North Carolina, Dave spent some time this week trying out two new quiche recipes. Quiche is a baked egg dish and one dish will serve 4 to 6 people. When served right out of the oven, it has that “melt in your mouth” quality that makes it a great comfort food and one that’s perfect to warm you on a wintry mountain morning. 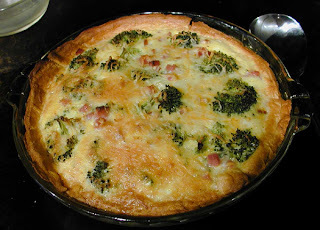 The first quiche to come out of the Inn on Mill Creek test kitchen was a broccoli crown and ham quiche. This is a common quiche; however, Dave experimented with a twist on the recipe and made a combination hashbrown and croissant crust rather than the typical pastry crust. Brigette and her mom, who was in town visiting, served as chief testers and reported that this one was “fantastic”. Dave, despite liking the big crowns himself said that next time he’ll be chopping the broccoli (nod to Saturday Night Live’s Dana Carvey) a little smaller. The second quiche was a sweet onion and full-leaf spinach quiche. This quiche was good because the onions weren’t too overpowering but were enough to give it a good crisp flavor. 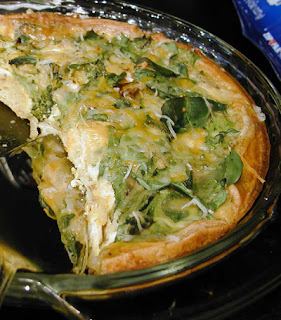 Anyone who loves spinach will love this quiche. Like the broccoli, Dave says he’ll chop the spinach a bit next time around. Stay tuned to see what other yummy dishes come out of the kitchen this season!